Nacre, also known as mother of pearl is a composite, organic-inorganic material produced in nature in the inner shell layer of molluscs and the outer coating of pearls. The material is resilient and iridescent with high strength and toughness, resulting from its brick-and-mortar-like architecture. Lightweight and strong materials are of interest in materials science due to their potential in multidisciplinary applications in sports, aerospace, transportation and biomedicine. In a recent study, now published in Science Advances, Yang Yang and co-workers at the interdisciplinary departments of Systems Engineering, Chemical, Biomedical and Aerospace Engineering at the University of Southern California, developed a route to build nacre-inspired hierarchical structures with complex 3-D shapes via electrically assisted 3-D printing. 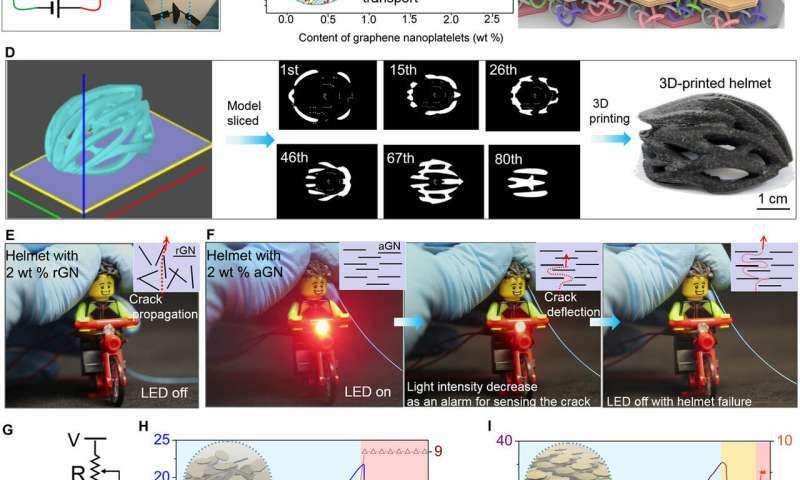 To create a brick-and-mortar-like structure in the work, they aligned graphene nanoplatelets (GNs) as bricks in the electric field (433 V/cm) during 3-D printing and included the polymer matrix as a mortar. 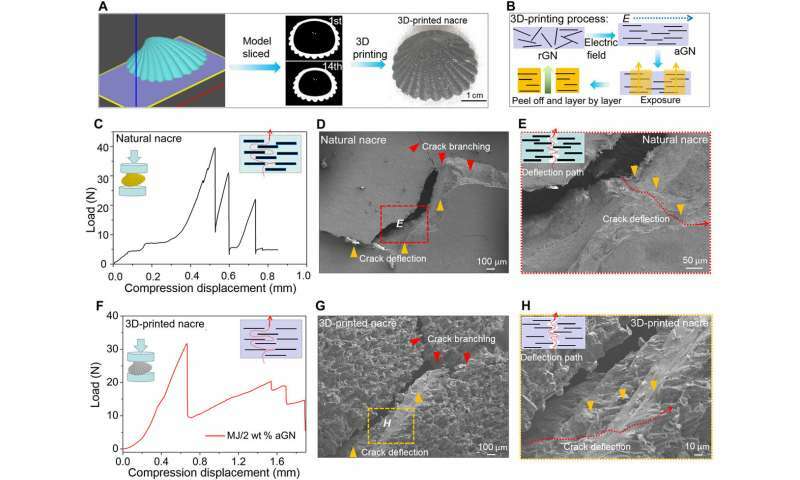 The bioinspired 3-D printed nacre with aligned GNs (2 percent weight) were lightweight (1.06 g/cm3), albeit with specific toughness and strength similar to the natural nacre counterpart. The 3-D printed lightweight, smart armor aligned GNs could sense surface damage to exert resistance change during electrical applications. The study highlighted interesting possibilities for bioinspired nanomaterials with hierarchical architecture tested in a proof-of-principle, mini smart helmet. Projected applications include integrated mechanical reinforcement, electrical self-sensing capabilities in biomedicine, aerospace engineering as well as military and sports appliances. Lightweight and strong structural materials such as multifunctional wearable sensors have attracted increasing attention in health monitoring, but most piezoelectric sensors are soft and cannot protect the surface of interest. A protective, multifunctional wearable sensor is currently in demand for military and sports applications therefore. The hierarchical structure of nacre in nature provides superior mechanical performance, notwithstanding its relatively weak constituents to protect the soft body in molluscs. The secret to its protective capability is inherent to its brick and mortar (BM) architecture that ranges from the nano- and micro- to macroscale. This outstanding materials property formed the basis to design light and strong armor for microstructural interfaces in materials science. Although traditional, bottom-up assembly processes such as vacuum filtration, spray coating, ice templating and self-assembly were previously studied intensively to build nacre-inspired architectures, the methods only focused on two-dimensional (2-D) thin-film formation or simple bulk structures. Since it is challenging to use these techniques to develop 3-D architectures - 3-D printing (additive manufacture) is a powerful alternative. Recent studies in materials science and bioengineering have used 3-D printing with shear forces, magnetic and acoustic fields to form reinforced composites with aligned fibers. In the present work, Yang et al. presented an electrically assisted 3-D printing method using aligned graphene nanoplatelets (GNs) in photocurable resin to build the nacre-inspired hierarchical architectures. 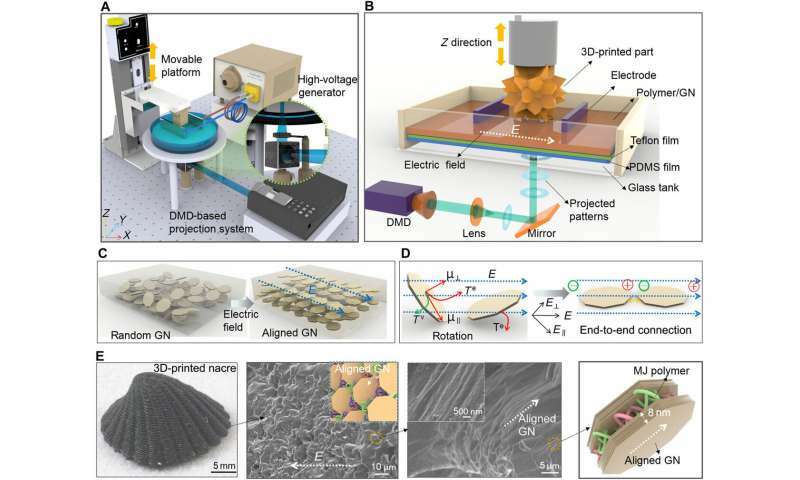 The proposed technique took advantage of the nanoscale-to-microscale assembly induced by the electric field and microscale-to-macroscale assembly via 3-D printing. The 3-D architectures with aligned GNs (aGNs) showed reinforced mechanical properties compared to random GNs (rGNs). The 3-D printed artificial nacre displayed specific toughness and strength comparable to natural nacre, with additional anisotropic electric properties unlike the natural nacre. The scientists propose to develop a smart helmet with inbuilt protective, self-sensing capabilities using the electrically assisted 3-D printing process. 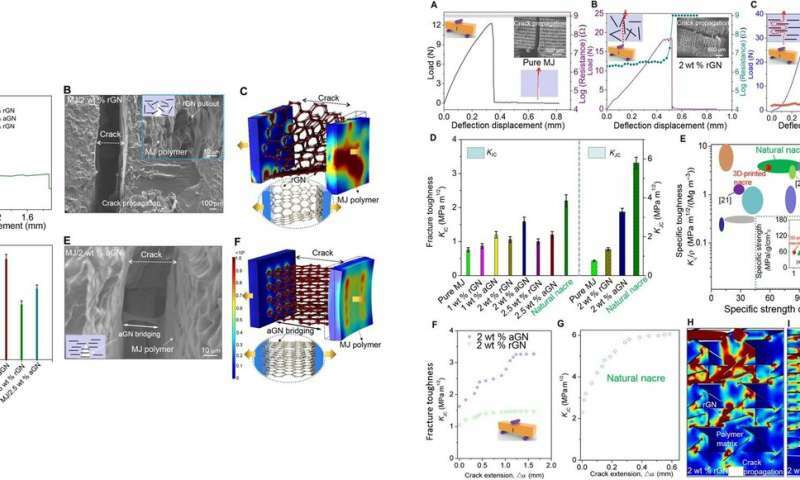 The bioinspired brick and mortar (BM) architecture can enhance mechanical strength and electrical conduction by aligning graphene nanoplatelets in each layer for maximum performance via crack deflection under loading. In total, Yang et al. aim to engineer multifunctional, lightweight yet strong and electrically self-sensing 3-D structures from the lab to industry. To replicate the challenging hierarchical, micro-/nano-scale architecture of natural nacre, the scientists used aGNs in a photocurable polymer, grafted with 3-aminopropyltriethoxysilane (3-APTES) to strengthen the interface and load transfer at the sandwich-like polymer matrix. For the photocurable resin, they used G+ resin from Maker Juice Labs, notated MJ, containing high tensile epoxy diacrylate, glycol diacrylate and a photoinitiator with excellent mechanical properties and low viscosity. The 3D-printing process. (A) Nacre model by SolidWorks (from Dassault Systèmes), sliced using the DMD-based stereolithography software to generate projection patterns. (B) rGNs are aligned by the electric field (blue dotted arrow shows the direction) to form aGNs during the 3D-printing process, the aligned composites solidify after light exposure (yellow part), the alignment of GNs is kept in the composites, after the layer is complete the building plate is peeled to print additional layers with aGNs. (C) Compression of natural nacre and SEM images of the fracture surface, showing crack deflection (yellow arrowheads) and crack branching (red arrowheads) in (D) and crack deflection between layers in (E). (F) 3D-printed nacre with 2 wt % aGNs under loading with crack deflection and branching in (G). (H) SEM image showing deflection between layers (yellow arrowheads). Credit: Science Advances, doi: 10.1126/sciadv.aau9490. To align the GNs in the composite during layer-based 3-D printing, Yang et al. used an electric field (433 V/cm) to build nacre-inspired MJ/GN composite structures. The scientists applied DC voltages, followed by Fourier transform infrared spectroscopy (FTIR) collection, optical imaging and scanning electron microscopy (SEM) images to characterize (i.e. test) the newly developed composites. The resulting parallel and closely packed GN sample layers were structurally separated by the polymer matrix in between as mortar to impart the critical structural features for mechanical performance in the 3-D synthetic nacre. The scientists saw similarities between the synthetic vs. natural nacre structure at the macro- and microscale. Prior to 3-D printing, Yang et al. created the nacre model using SolidWorks software first, and then sliced it with in-house developed digital micromirror device (DMD)-based stereolithography software to generate surface patterns. They projected masked images of the computed patterns on the resin surface to construct layers in which the electrically assisted 3-D printing process aligned and selectively polymerized the programmed parts for specific reinforcement orientation, layer upon each layer of the MJ/GN composites to create the structure of interest. The scientists formed the desired gap between the GN alignment in the MJ resin, prior to photocuration using the DMD light projection system (3.16 mW/cm2) available in the setup. LEFT: Mechanical property and microstructure study of 3D-printed nacre. (A) Comparison of compression properties of the 3D-printed nacre with different loadings and alignments. (B) Crack propagation in MJ/rGNs nacre with the breaking of rGNs. (C and F) Simulations of stress distribution of MJ/rGNs and MJ/aGNs by COMSOL Multiphysics, respectively. (D) Comparison of maximum compression load for the 3D-printed nacre with different mass ratios of GNs. (E) Crack deflection of MJ/aGNs nacre and bridging and interlocking of aGNs. RIGHT: Comparison of fracture toughness by three-point bending test. (A to C) Compression force versus resistance change for pure MJ, MJ/2 wt % rGNs, and MJ/2 wt % aGNs, respectively (with inset SEM images showing the related fracture surfaces). (D) Comparison of fracture toughness for crack initiation (KIC) and stable crack propagation (KJC) of the 3D-printed nacre with the natural nacre. (E) Comparison of specific toughness and specific strength of the 3D-printed nacre with others’ work (inset shows the specific strength with density for various nacre-inspired composites). R-curves of the 3D-printed nacre (F) and the natural nacre (G). Simulations of stress distribution by COMSOL Multiphysics for the 3D-printed nacre with rGNs (H) and aGNs (I). Credit: Science Advances, doi: 10.1126/sciadv.aau9490. They then compared the stress-strain behavior of the 3-D printed nacre with rGNs (random) and aGNs (aligned) for different ratios. Compared to natural nacre, the synthetic version showed typical brittle fractures with crack propagation at first. Yang et al. used structural simulation using COMSOL Multiphysics to show the site of stress concentration and the importance of accurate GN alignment for crack deflection and energy dissipation in the synthetic nacres. When they conducted structural simulations of optimized aGN sheets with 2 percent weight in the study (2 wt %), they showed the formation of bridges that lead to stress distribution at the joint area between the aGNs and polymer matrix to carry loads instead of promoting macroscopic crack advancement. The structures contained covalent bonding, hydrogen bonding and π-π interaction to synergistically bridge the aGNs for enhanced biomechanical properties. To test the mechanical properties, the scientists conducted three-point bending tests to measure the toughness of 3-D printed composites with rGNs, aGNs and a reference pure polymer sample. After adequate GN alignment they obtained stable crack arrest and deflection comparable to natural nacre, by toughening the brick-like platelets. The results indicated resistance to fracture during crack growth for aGNs. The nacre-inspired aGN composites showed bridging and interlocking that translated to an increase in dissipated energy and toughening, contributing to the outstanding crack arrest performance of the composite. The synthetic 3-D nacre was more lightweight than natural nacre, with lower density compared to the previous synthetic composites. The 3-D synthetic version showed significantly improved electrical conductivity contrary to natural nacre, which Yang et al. tested using piezoresistive responses useful for self-sensing military and sports applications. As a proof-of-principle, the scientists designed a wearable 3-D helmet for a Lego bicycle rider using the technique to study its self-sensing capability. The helmet composed of aGNs showed improved impact and compression resistance compared with rGNs, verified with impact tests where the rGN helmets broke while the aGN helmets retained their shapes. Yang et al. showed that a helmet composed with aGNs (0.36 g) connected to an LED light was able to sustain the impact of an iron ball 305 times its weight (110 g), where the brightness of the LED light only decreased slightly after the impact due to crack formation, energy dissipation and increased resistance. 3D-printed smart helmet with anisotropic electrical property. (A) Anisotropic electrical property of the 3D-printed nacre. (B) Changes of electrical resistance with different GNs loadings and alignments. (C) Schematic diagram showing the layered polymer/GNs structure with anisotropic electrical resistance. (D) 3D-printing process of a self-sensing smart helmet. Demonstration of the wearable sensor on a Lego bicycle rider showing different self-sensing properties for the 3D-printed helmets with rGNs (E) and aGNs (F). (G) Circuit design for the tests. Compression force of the 3D-printed helmets with related compression displacements and resistance changes for rGNs (H) and aGNs (I), respectively. (Photo credit: Yang Yang, Epstein Department of Industrial and Systems Engineering, University of Southern California.). Credit: Science Advances, doi: 10.1126/sciadv.aau9490. The scientists constructed a resistor-capacitor (RC) circuit to measure the changing resistance during the impact and during compression tests. In the rGN helmet the LED was always off due to the larger resistance, comparatively the smaller resistance of the aGN helmet left the LED light turned on. In this way, Yang et al. showed how the nano-laminated architecture provided extrinsic toughening and enhanced electrical conductivity due to bioinspired, aligned GNs in the nanocomposites. They propose to enable mass customization, assisted with 3-D printing capabilities to translate the lightweight smart materials ingrained with excellent mechanical and electrical properties for commercially viable applications in widespread industries.